After months of hard work, controversy and perseverance, iLaugh 2.0 is finally launching. 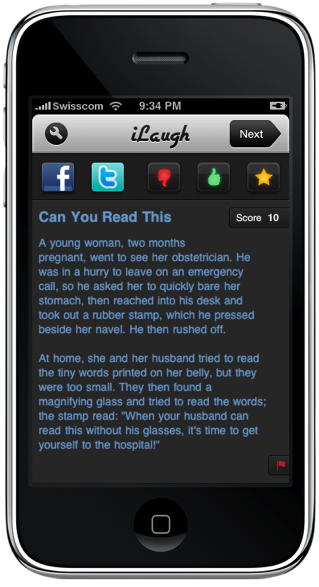 iLaugh puts a database of over 50,000 jokes in the palm of your hand. Vote on your favorite jokes, compile a list of your favorites, share jokes with your friends via Twitter and Facebook, and most importantly, have a good laugh. With iLaugh, you have complete control over which jokes you want to read. The Categories feature gives you the ability to only read the jokes that interest you. Additionally, you can filter out adult jokes or jokes voted down by the community. This entry was posted on Tuesday, June 16th, 2009 at 5:02 pm	and is filed under English, Humor, Release, iPhone. You can follow any responses to this entry through the RSS 2.0 feed. You can leave a response, or trackback from your own site.